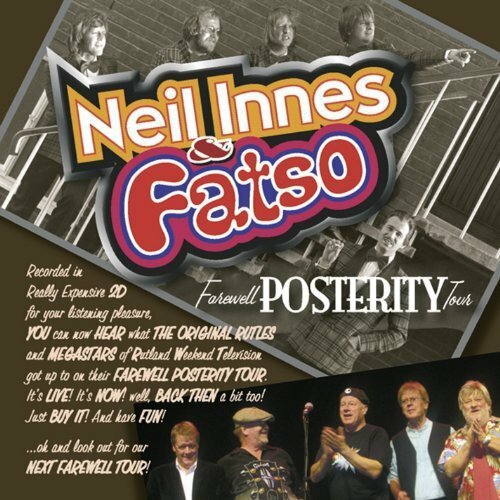 Neil Innes and Fatso, Farewell Posterity Tour – Recorded during a reunion tour with his band from Rutland Weekend Television, this is an eclectic mix of material. It includes some comedy bits, like “Testing 1, 2” with its number puns, and an Elvis-style skit where the background singers argue with the lead. The Bob Dylan parody “Protest Song” and early Bonzo Dog Band hit “I’m the Urban Spaceman” are both included, the latter with more of a country sound than usual. So are Eric Idle’s “Philosophers Song” and “Brave Sir Robin” from Monty Python and the Holy Grail. There are a few Rutles songs scattered throughout, including John Halsey who played Ringo Starr analogue Barry Wom doing the lead vocal on “Living in Hope,” as well as a medley of several other Rutles tunes. And on the Beatles theme, there’s a cover of George Harrison’s “Beware of Darkness.” “Eye Candy” is a mariachi-style song with some fake Spanish in the chorus, about the heavy influence on television on society. The country song “Crystal Balls” lets the audience yell out “Balls!” at appropriate times. I’ve heard the song before, but I’ve come to appreciate this one more from the live rendition. There’s a thematic consistency in that it’s followed by the swing number “Fortune Tellers.” “Ego Warriors,” which appeared on the last Bonzo Dog Band album, includes an amusing swearing-in session.” Charlie Big Potatoes” is a rambling narrative about an obnoxious character, with its title coming from golf commentary. “One of Those People” comments on how much crap we have to put up with. It’s a good combination of stuff from throughout Neil’s career. This entry was posted in Albums, Beatles, Concerts, Humor, Monty Python, Music, Television and tagged bob dylan, bonzo dog band, elvis presley, eric idle, farewell posterity tour, fatso, george harrison, john halsey, monty python and the holy grail, neil innes, ringo starr, rutland weekend television, rutles. Bookmark the permalink.